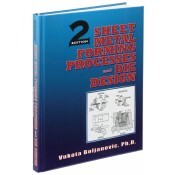 This long-awaited new edition of a best-selling text and reference provides an expanded and more comprehensive treatment of sheet metal forming processes, while placing forming processes and die design in the broader context of the techniques of press-working sheet metal. Included are the “hows” and “whys” of product analysis, as well as the techniques for blanking, punching, bending, deep drawing, stretching, material economy, strip design, movement of metal during stamping, and tooling. While concentrating on simple, applicable engineering methods rather than complex numerical techniques, the author uses many illustrations, tables, and charts to enhance comprehension and learning.